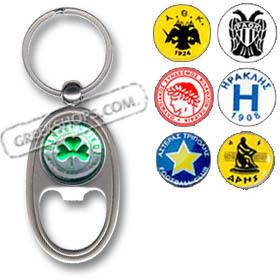 Silver bottle opener keychain with your favorite Greek soccer team emblem. Available with the AEK, Aris,Asteras Tripolis, Hraklis, Olympiakos, Panathinaikos, or PAOK emblem. A great gift for a sports fan, and makes a fun party favor!